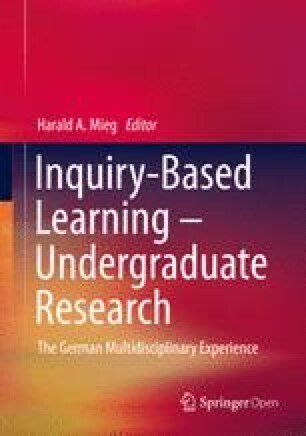 The following article explains the didactic challenges of inquiry-based learning in light of the current, in part paradigmatic, shift in university education. To this end, I will outline the charged relationship between the traditional ideal of education and contemporary societal and educational policy expectations for academic studies, in which the teaching and learning at institutions of higher learning are currently situated. In order to counteract the oft-lamented conceptual blurring of inquiry-based learning, I have undertaken to limit and delineate the use of the term. The classification of the approach within the context of the history of ideas serves to make clear the complex historical social causal network within which university education must be interpreted and shaped. Furthermore, I undertake an internal differentiation of inquiry-based learning in order to be able to systematize various degrees of expression and forms. The next step is to develop research-oriented learning and teaching in an evolutionary way by structuring these progressively along a course of studies based on this development-oriented approach. Manifestations of inquiry-based learning are ordered and classified by differentiating between various dimensions of understanding and knowledge, and taking into account different course formats. Finally, not only the opportunities and scope of inquiry-based learning, but also limitations and risks are outlined in order to avoid an overly euphoric stylization of the approach, while ignoring specific structural and curricular deficits.